A week ago I changed it up. I usually just work from home during the afternoons after a morning doctor or dentist appointment. But this time I decided to do something different, booking vacation time instead. The idle thought of riding to Frog Level had turned into a not-so-idle thought. 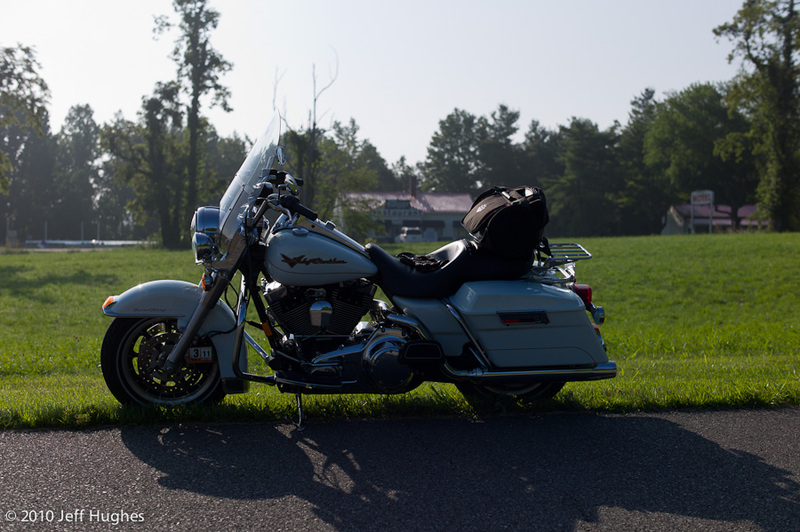 I've also been thinking about a week-long trip on the Harley sometime this summer, to someplace undetermined, and so figured it would be good to do a dry run with the as-yet-unused sissy bar pack I bought for just such trips two years ago. 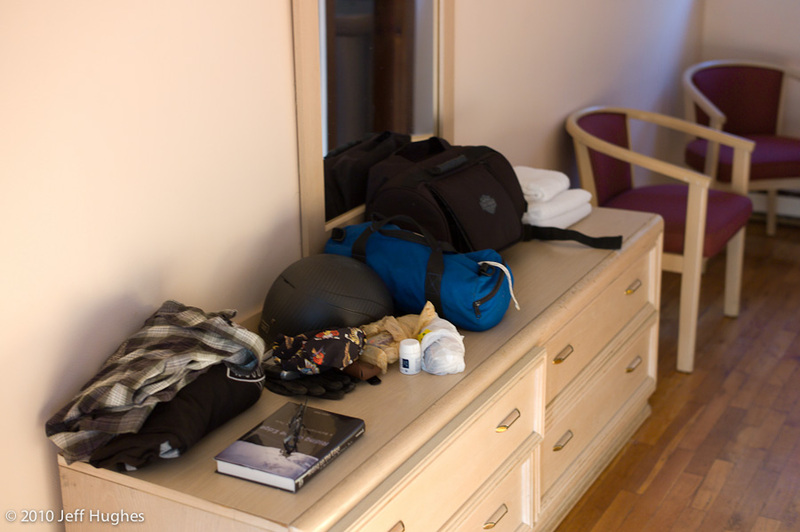 My packing routine on my BMW's - what goes in the tank bag, what goes in each of the saddlebags, what goes in the tail trunk, etc. - was nailed down years ago, of course. 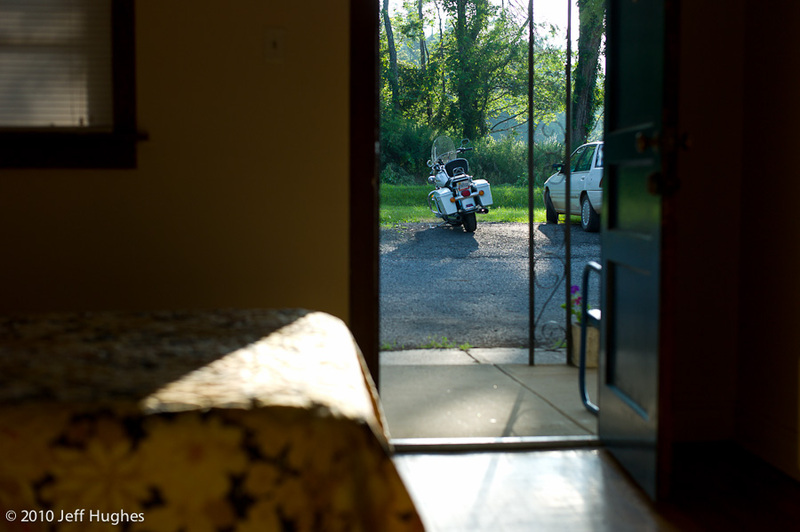 But the Harley remains a near-virgin with respect to overnight trips. I've still got to sort out what will go where on the big V-Twin. Alas, I was way late getting home Thursday night, after spending four hours after work in line at the Apple Store picking up Ginny's new iPhone. No time to pack or map out routes or anything. And by the time I got home from the doctor the next day it was already midday. I needed to get going. So I decided to travel quick and light. No sissy bar pack (just the little bag I keep attached to it to carry my camera stuff). I grabbed a spare t-shirt and pair of skivvies, a toothbrush, and the Glock .45 and tossed them into one of the saddlebags. Done. It was already pushing ninety by the time I left. 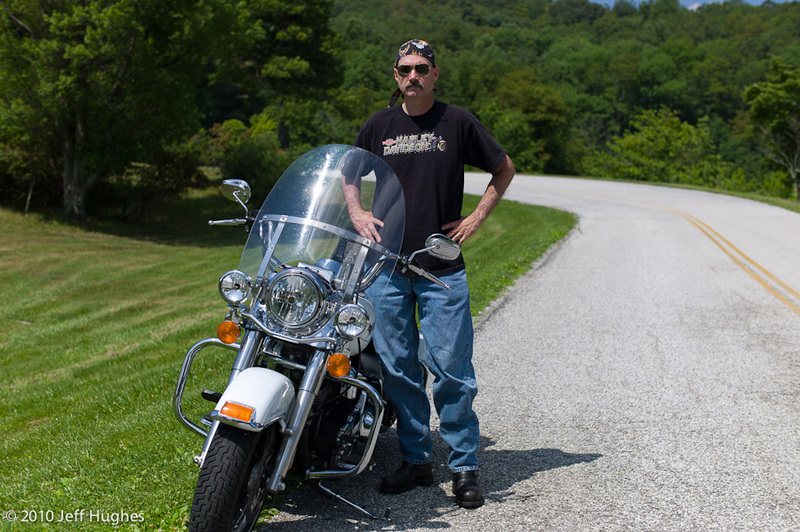 But t-shirt and jeans and a fast-moving Harley were a pretty good cure for that. God's own air conditioning. Frog Level was still on my mind, but not having left until early afternoon, I knew it was a stretch. I kept the routing for it programmed into my Zumo so I could watch time and distance to it progress over the afternoon, but I was already mentally moving into plan B. 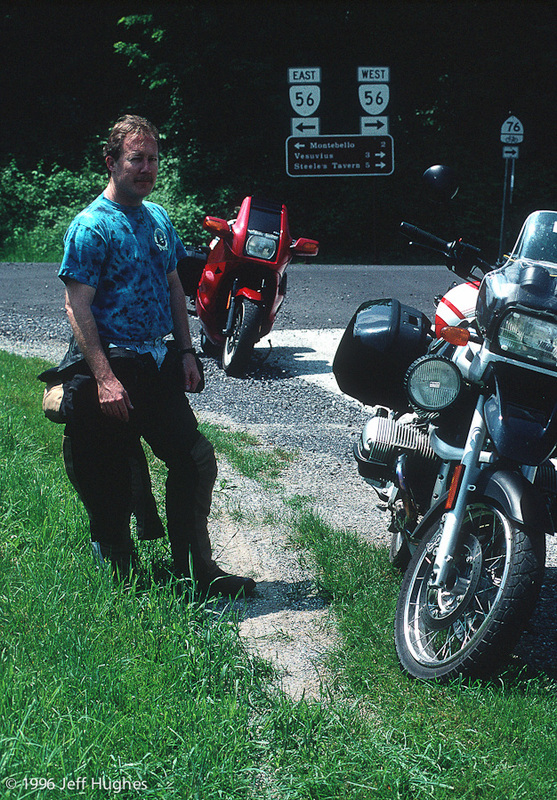 In 2001 I did a little trip down the Blue Ridge Parkway (A Little Trip South). 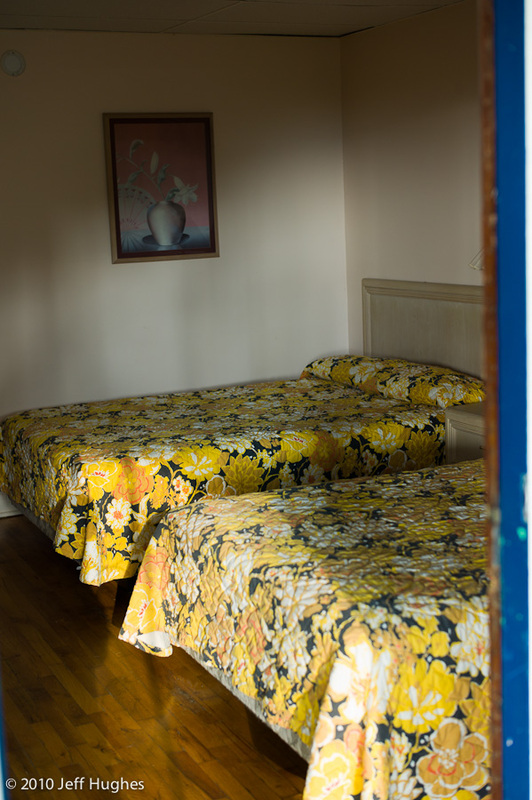 I had good memories of my first-night stay at the little motel/restaurant there. I've thought ever since of reprising it. And so the afternoon found me gliding down the BRP, with thoughts of either Frog Level (remote) or Tuggles Gap (more likely) on my mind. I was surprised at the lack of traffic. Just last weekend, on riding down to visit my folks, I'd had to do a dozen double-yellow passes in the first 28 miles. Today, there's hardly anyone else here. Then I rememberd. It's Friday. Of course. At rt. 56, I pull off. Jay and I stopped here for a breather on our 2-day trip in 1996. We were a few hours earlier in the day on that trip, but the day is similar otherwise. Lots of bright sunshine. Being solo changes the ride in subtle ways, though. A fellow and his wife stop to see if I'm alright. That hardly ever happens if you're in a group. My next brief stop is at Bluff Mountain, mile marker 53. 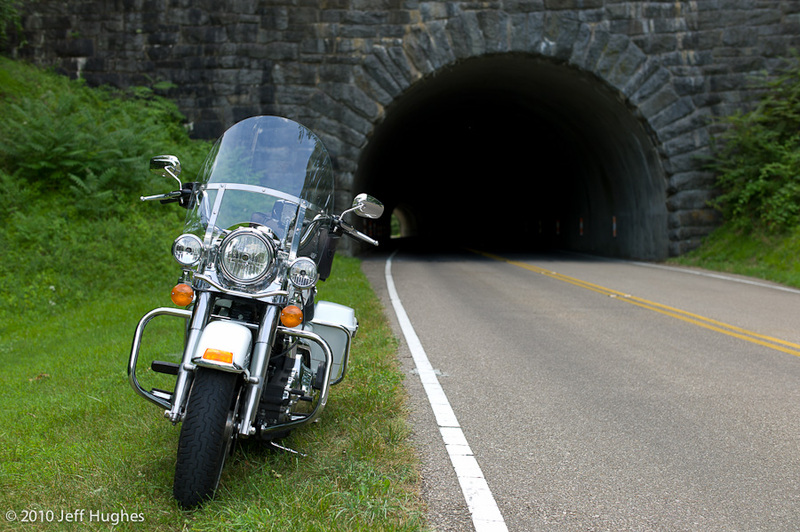 There are a bunch of tunnels on the North Carolina side of the Parkway, but only one in Virginia. 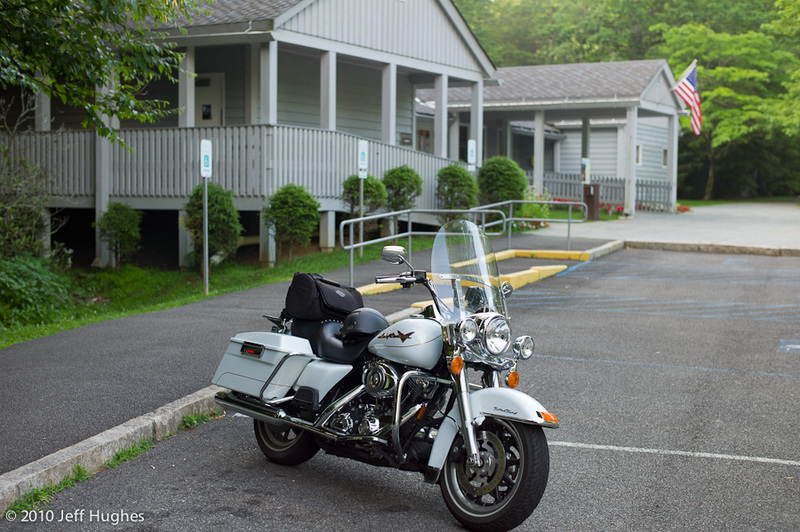 I stopped here on my week-long trip in 2002 - the trip where I took a bunch of pictures in hopes that Rider magazine would run a story of mine on the BRP. Rider didn't bite on that article. And a few months later I started writing for Sport Rider magazine instead. For years I've stopped at the Peaks of Otter (the tiny little gift shop and visitor center, not the large, touristy lodge). Usually for an ice cream. And a restroom break. Today, though, I'm not having to pee much. That, along with the veil of fatigue which is descending upon me, lets me know I'm deyhdrated. 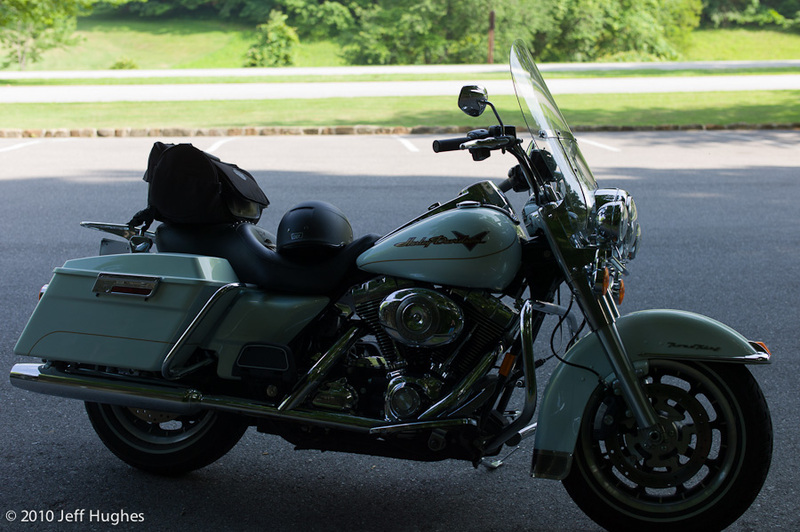 You don't feel it as much when you're riding along in the cool breeze of upper elevations. And riding along in shirt sleeves quickly strips moisture from your body. A half-liter of water helps. Roanoke Mountain, at mile marker 120, is one of my favorite places. Jay and stopped there on that trip in 1996. And I've stopped there numerous other times, as well. 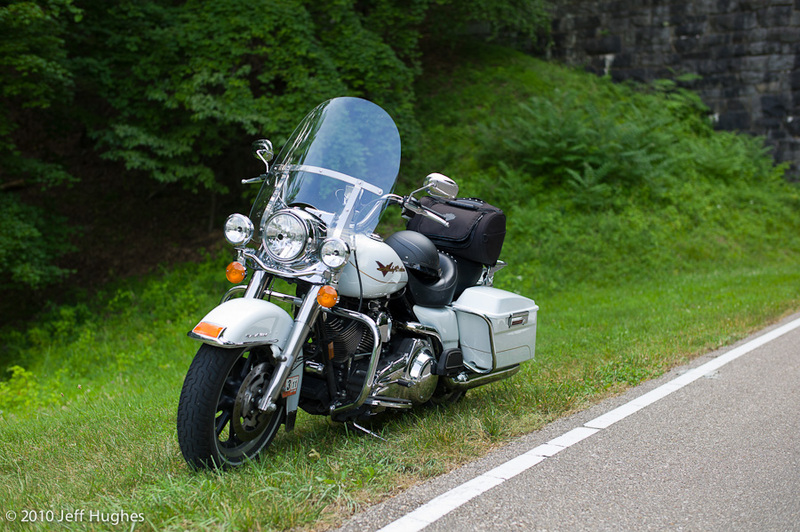 Sometimes I'll leave home with a peanut butter and jelly sandwich and a few Ritz crackers in my saddlebag, ride down to Roanoke Mountain where I'll enjoy my simple lunch, then turn around and head home. 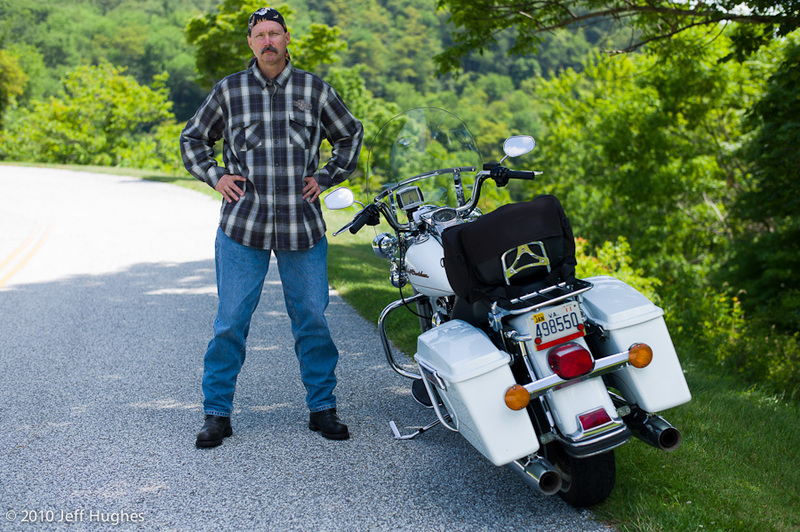 That gives me 240 miles of BRP riding and a 430-mile day. Just about perfect. Today, I have another thought in mind. There's hardly any cell service anywhere on the BRP. And I'm pretty sure Tuggles Gap won't have any either. But atop the mountain there outside Roanoke you usually get a bar or two. So I ride the little 4-mile loop road up the mountain and send Ginny a text of where I am and where I think I'll probably be spending the night. The last hour is a contrast of beauty and weariness. There is hardly a prettier place to be found than along the spine of the Blue Ridge, peeking occasionally over into the hollows which shape the land. 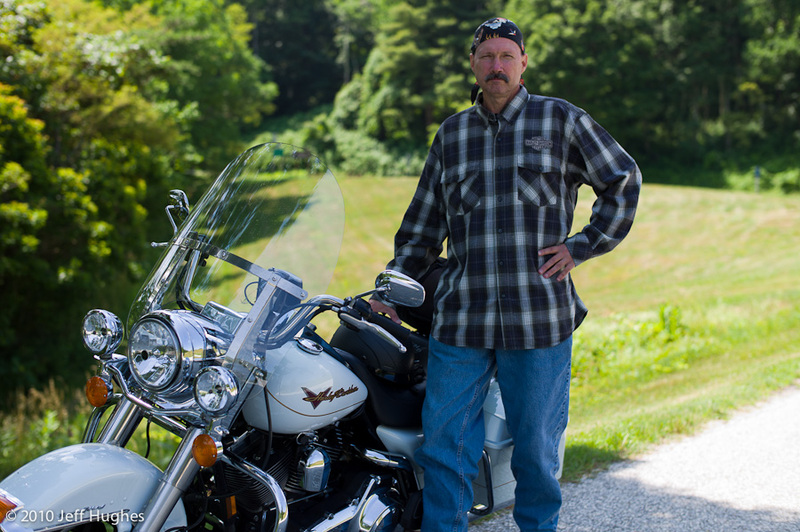 And I know the coolness through which I ride is a remarkable gift, considering the hot day that most people down off the mountains are experiencing. But I am incredibly tired. 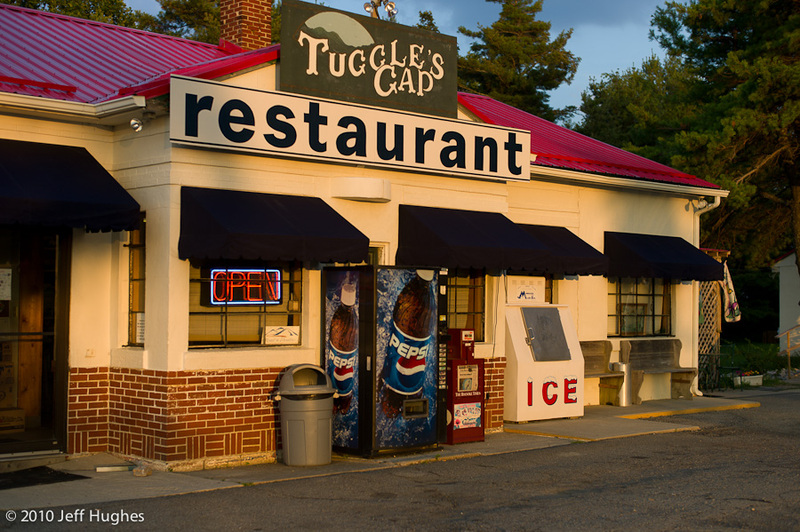 It is with a feeling of great relief when I finally arrive at Tuggles Gap. "You know there's no telephone or TV?" the pretty young girl says in response to my query about a room. "That's fine," I smile. I fill out the form and she hands me the key to room #3. Fifteen minutes later I'm gassed up for the morrow and have unpacked my sparse gear. Another pretty girl takes my order. 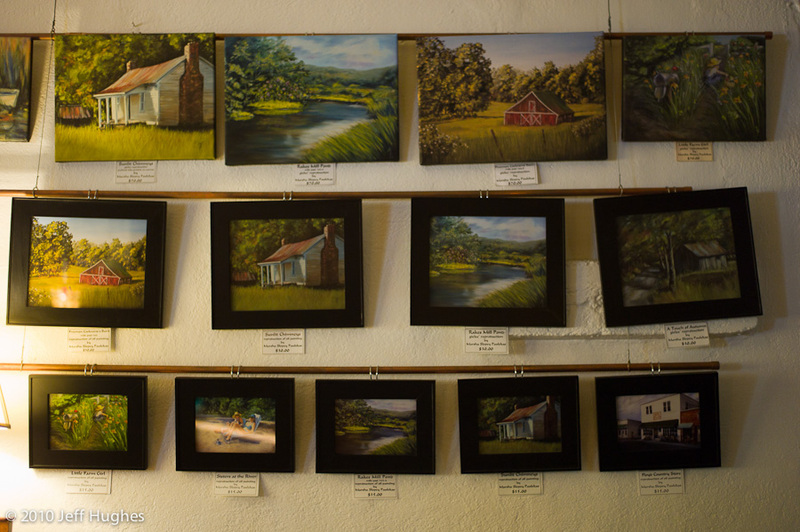 There's art on the wall to be bought. And there's a local fellow providing the Friday-evening entertainment. 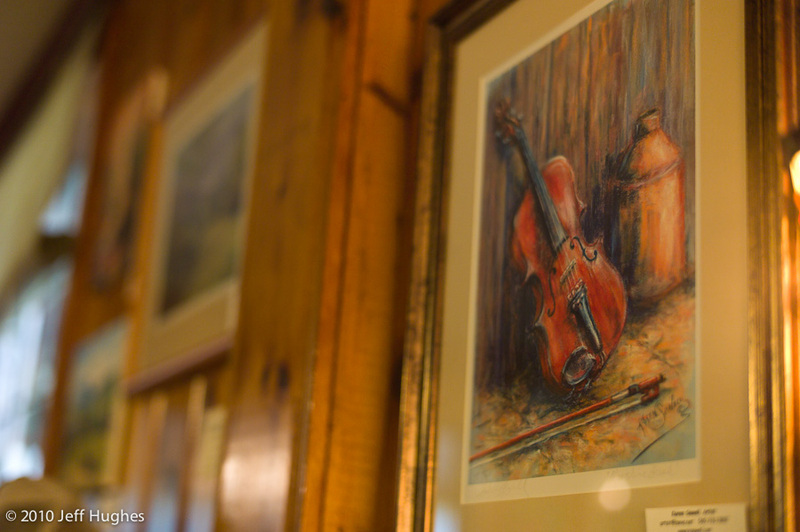 Bluegrass, naturally. My supper of country-fried steak, mashed potatoes and gravy, green beans, and iced tea - topped off with a large wedge of hot apple pie and vanilla ice cream - hits the spot. 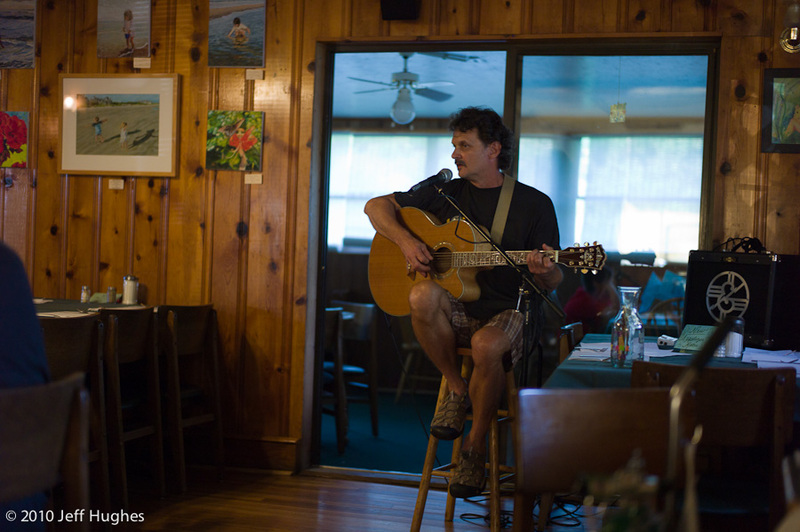 When I'm done I tip the musician, smile at the girls, and buy a single beer to take back to my room. Walking back, the sun is just about to set. 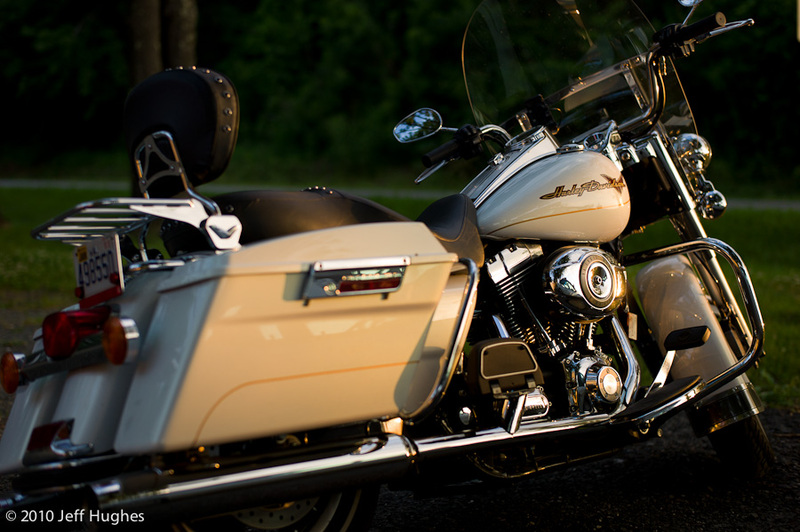 Noting the soft, angular light, I pick up my Leica and catch a shot of my Harley, bathed in its glow. 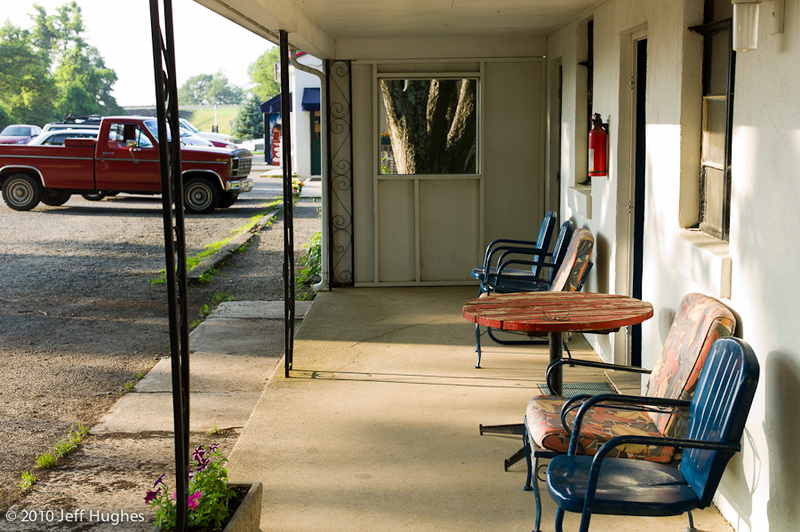 Then a couple shots of the restaurant/motel. 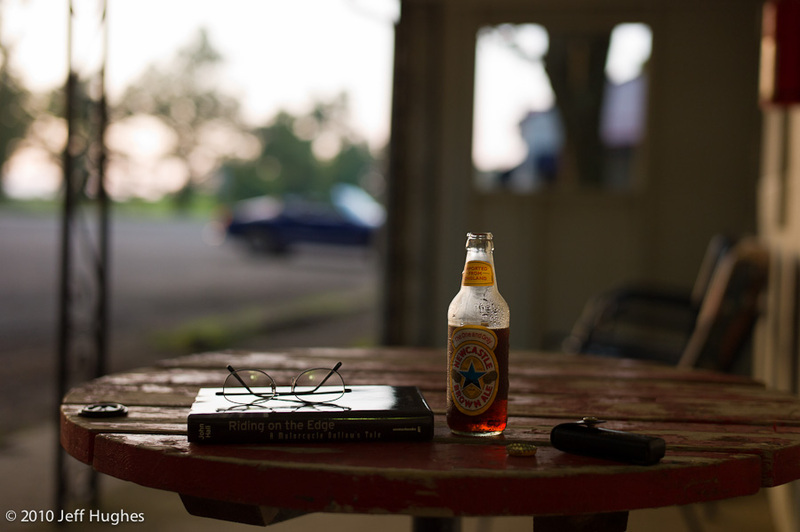 Settling down on the porch with my book and my beer, I enjoy the falling light, and the day winding down. What a lovely way to end things. I had asked the girl what time the restaurant opened for breakfast. "Eight o'clock," she had answered. I didn't want to wait that long, so the next morning I'm packed and gone shortly after daybreak. Heading south. 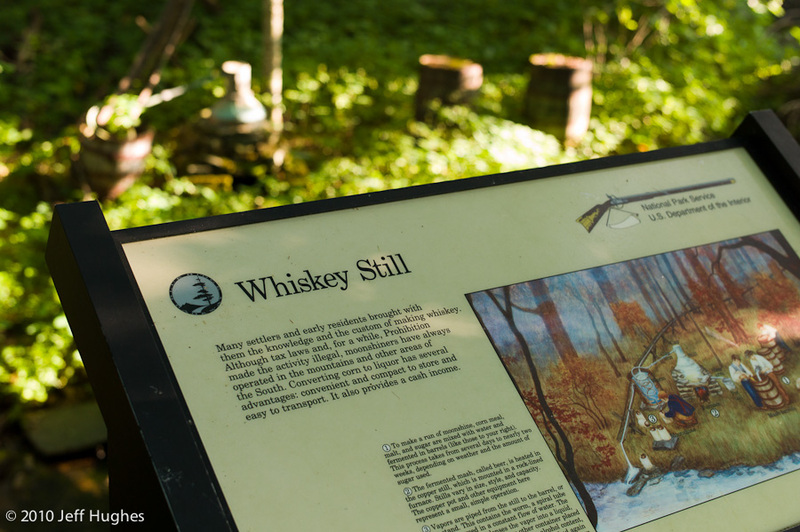 Mabry Mill is only ten miles away. I figure they'll probably be open. If there's ever been a finer ten miles, I'm not sure where it might have been. 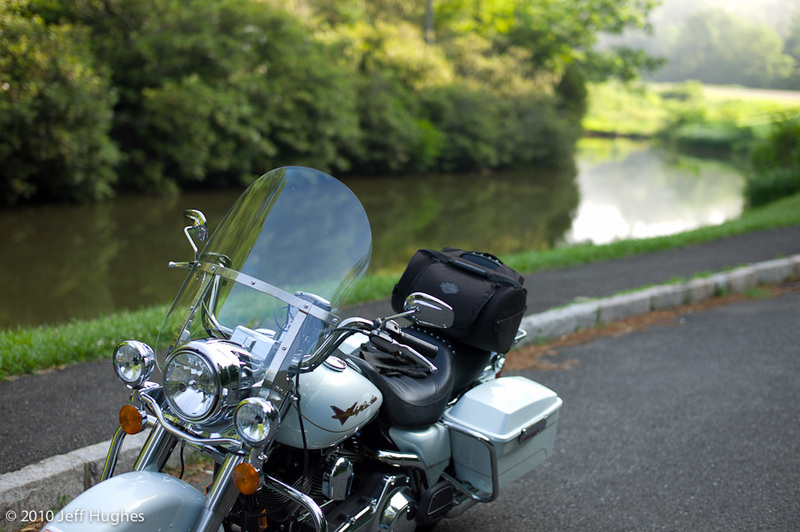 Waking up on the Blue Ridge Parkway has to be one of lifes most grand of pleasures. "4th gear and 45mph," I tell myself. "Watch for the deer." But within a mile I'm lost in the reverie of this great road, with its tendrils of mist rising out of the shadows, and the early light gracing an extraordinary landscape. The curves themselves are mesmerizing in the way they touch you, in the way they pull you into them. And this big, booming Harley gloms to them in the same way all my other bikes always have. 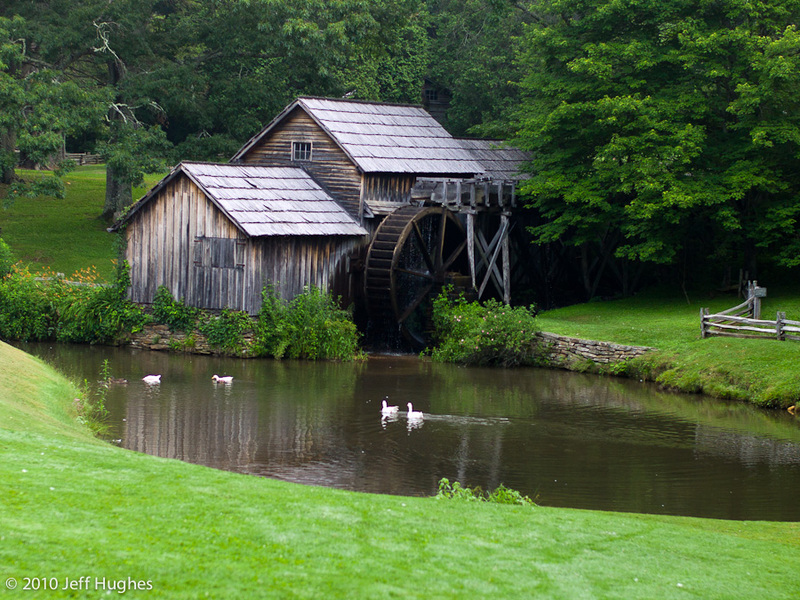 I arrive at Mabry Mill all too soon. I grab a couple quick pictures of the mill, then head inside. All the ladies are queued up in the small lobby and smile at me as I walk in, like I'm some kind of visiting dignitary or something. I'm the first person in the restaurant. After a fine breakfast I head back outside. 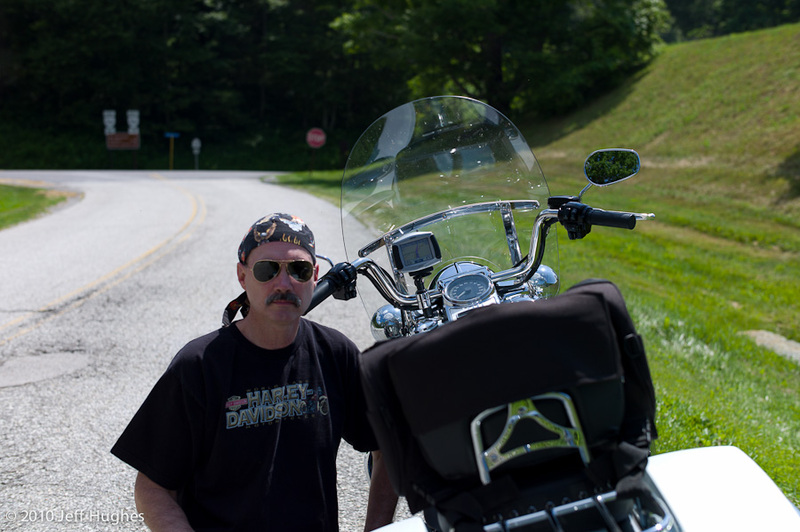 I'm eager to get back on the road again, but nevertheless tarry for awhile. 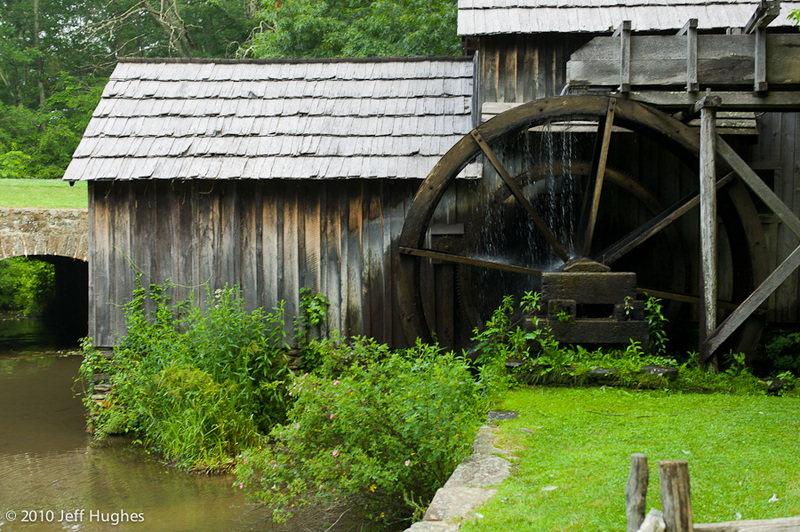 I like country things and the culture of old Appalachia and so I wander around the mill for a bit, enjoying the examples of technology and craftsmanship on display. I have always been much impressed by the ingenuity by the people of the mountains. 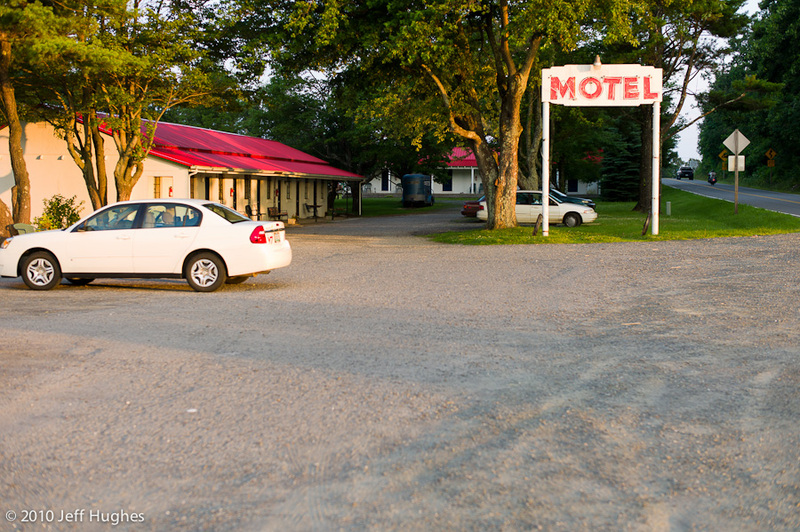 Heading back north, I make a quick stop ten miles on, grabbing a shot from the Parkway of the Tuggles Gap restaurant and motel I stayed in last night. 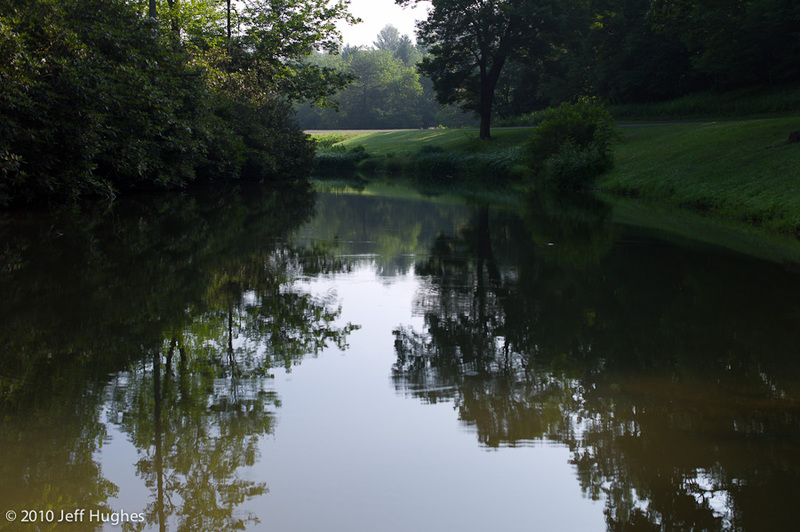 And then a few miles north of that, at Rakes Mill pond. 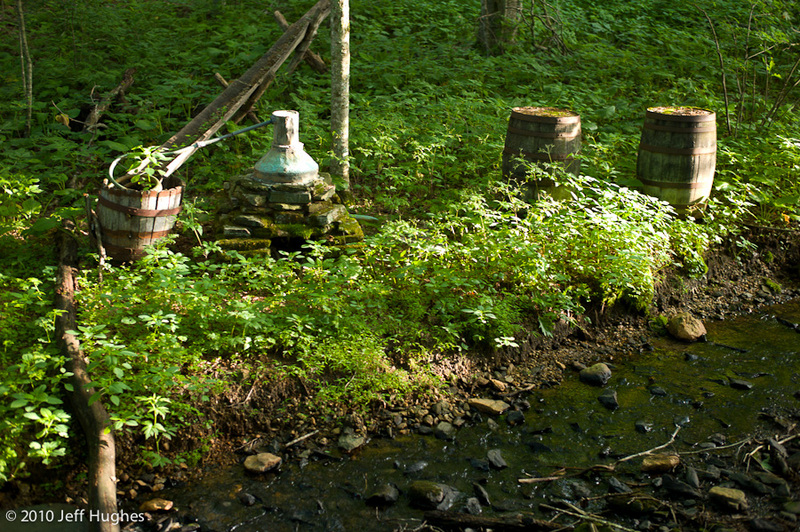 As the story goes, Jarman Rakes dammed the creek in the early 1800's, stocking it with brook trout and allowing his customers the exclusive use of it while waiting for their grist to be ground. 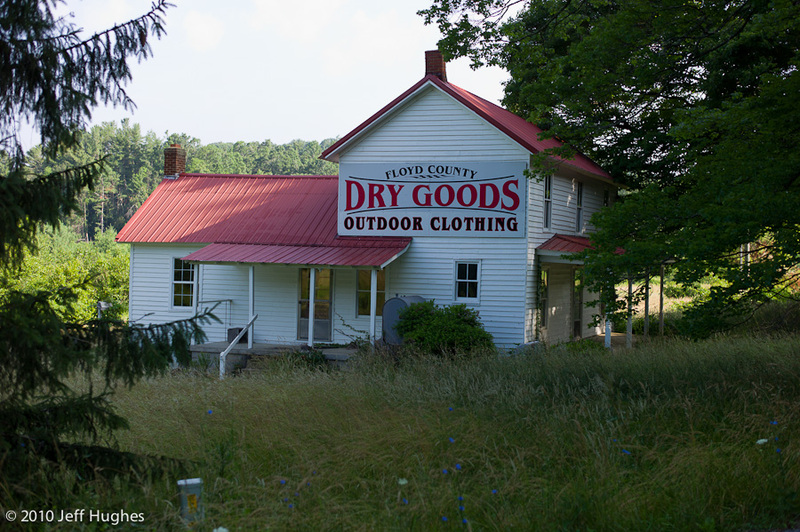 And, finally, I turn off to get this shot of the Dry Goods sign on this house. I've passed this spot on the Parkway numerous times and have always been struck by the bright, red sign looming off the side of the road. This morning, at last, I stop to get a picture of it. With those stops out of the way, I begin my trip north in earnest. There's no particular reason to press. I don't have an agenda. And I don't need to be home any particular time. But the glory of this great road, early on a summer morning, is hard to contain. So I just give in to it, rolling on and on. 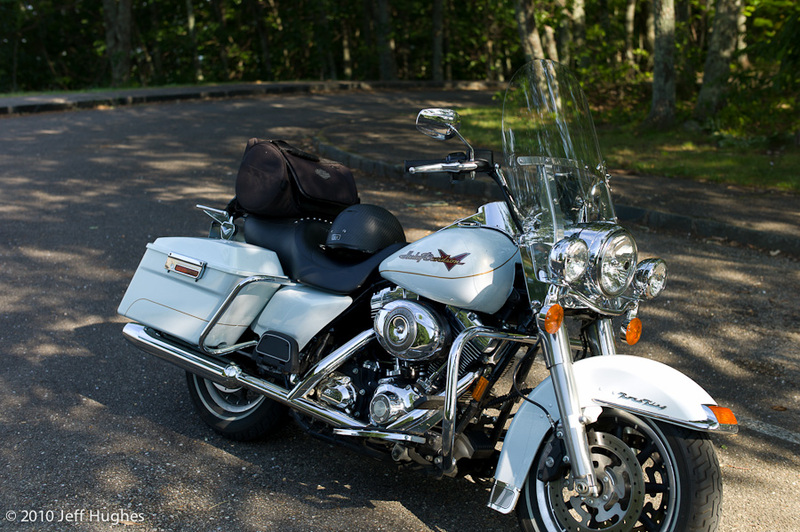 My pace on the Harley isn't a whole lot different than on my other bikes. A little perhaps. But not much. I still find myself continually running up on other bikes and cars. Then you have to decide whether you want to double-yellow pass the guy or wait what might be miles before the next legal passing zone. I still do it - burn past the vehicle and pray that a ranger doesn't pop around the corner in the few seconds it takes to get it done - but not as often or as aggressively as I used to. 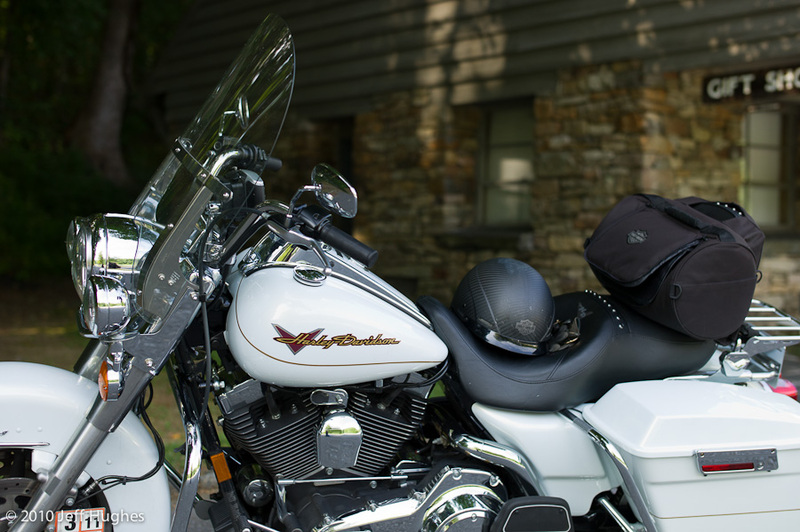 The Harley is easier to ride slowly (meaning, cough, the speed limit) than my sport-touring bikes, and so makes that a less-hard question. No one ever comes up behind me. A quick stop at Peaks of Otter. And then again, like yesterday afternoon, with most of the Parkway behind me, I swing into the pull-off at rt. 56 for a quick breather. A surreptitous pee on the side of the road and a half-liter of water that has but a hint of coolness left in it. I knew when I left yesterday that today would be even hotter. Mid 90's. And so my rough plan has been to stay atop the mountains as much as possible where, if anything, it's still a little chilly. But I need to get gas and so when I get to Afton I drop off the mountain down into Waynesboro. After fueling, I stop at the local Tastee Freeze for a quick lunch. Back outside, it's hot but not unbearable. I swap out of my t-shirt and replace it with the tank top I've brought along. Then I head north on rt. 340, up the valley. Even with the full-effect air conditioning afforded by my attire, the floor of the Shenandoah Valley quickly turns into a blast furnace. It doesn't help that I get stuck in a line of vehicles moving behind a slow panel truck. Seeking relief, at Elkton I head east on rt. 33. Skyline Drive is only seven miles away. And so winds down the last couple hours of my ride. Skyline Drive is fraught with people. Unlike yesterday and this morning, there's no way to be alone. But I don't care. It's cool and pleasant. 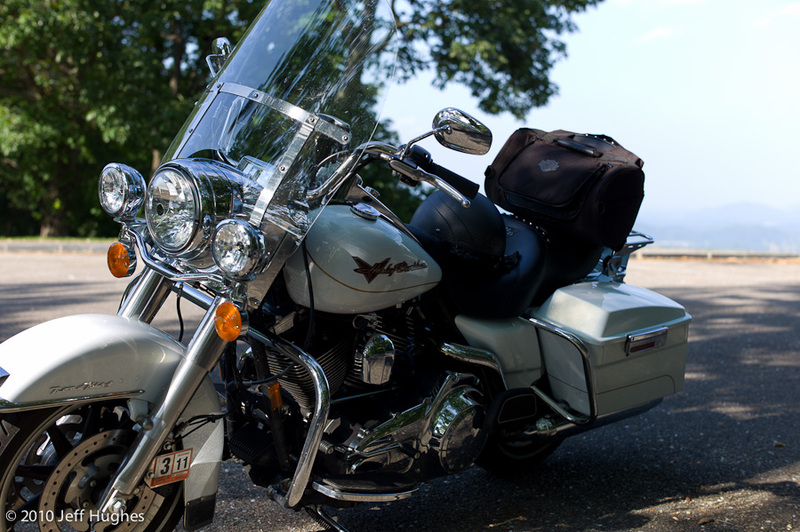 And I'm thinking there can't be a better conveyance for doing all this than the big Harley beneath me. There's a quick stop at Big Meadows. And then one more at the Shell east of Sperryville. Then the final 30 mile push to home. Thinking what a glorious 27 hours this has been. Already thinking about doing it again. And still thinking about Frog Level.